John Walters received a degree in Music Education from the University of Texas at Austin. 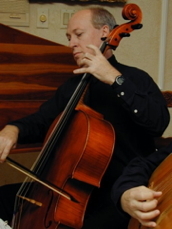 He studied cello under Michael Matesky and Paul Olefsky. After receiving his degree he became an orchestra director in the Austin Independent School District. His orchestras consistently received outstanding awards both locally and throughout the United States and Canada, including at competitions in New York, Seattle, Los Angeles, Toronto, and Montreal. His interest in chamber music and early music started while in college and has continued to this day. He was one of the founding members of Austin’s popular group, The Clearlight Waites, and has been a core member of Texas Early Music Project since its inception. He plays most string instruments including cello, bass and treble viola da gamba, rebec, vielle, violin, mandolin, oud, and guitar.